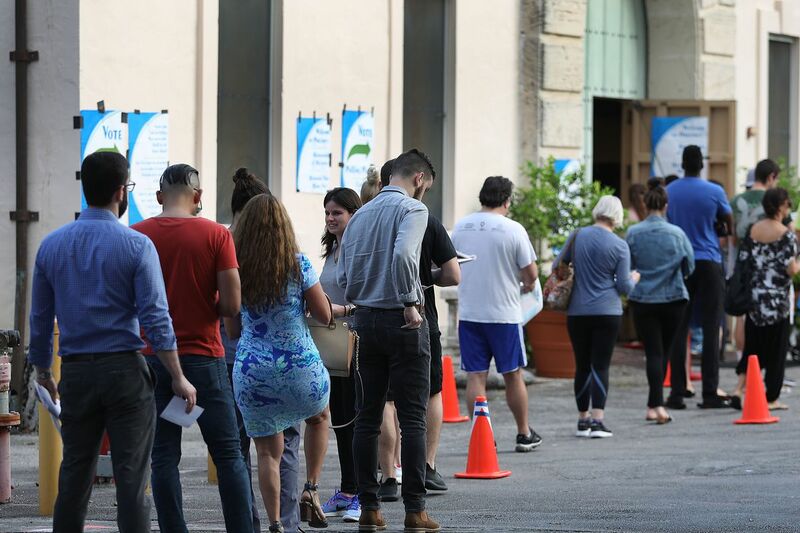 Voters line up to cast their ballot just before the polls open in the mid-term election on November 6, 2018, in Miami, United States. Hereâs the good news: Just hours before millions vote in the 2018 midterms, top US security officials said they see no evidence a foreign government compromised the election. But now hereâs the bad news: Those same officials say Russia and other countries aim to âinfluenceâ the election, in part by spreading misinformation. In other words, your actual ballot is safe, but other countries may still try to influence how you vote. The Monday night statement by Director of National Intelligence Dan Coats, Homeland Security Secretary Kirstjen Nielsen, Attorney General Jeff Sessions, and FBI Director Christopher Wray was clearly meant to calm any nerves ahead of the election. But itâs unsettling to hear that adversaries are still trying to shift public opinion, mostly via online methods. During the 2016 presidential election, for example, Russia used fake Facebook ads, Twitter bots, and other means to sow discord among the public and spread false information. It seems Moscow is at it again, and that China and Iran are also running influence campaigns. âThey can do this by spreading false information about political processes and candidates, lying about their own interference activities, disseminating propaganda on social m edia, and through other tactics,â the statement by leading US security officials reads. President Donald Trump signed an executive order in September that would allow the US to automatically sanction any foreigner caught trying to interfere in the election, but that doesnât seem to have slowed down the pace of meddling attempts. The Boston Globe reported on Monday that the federal government has logged more than 160 instances of suspected interference since August 1 and has jumped to about 10 instances a day in the few weeks before the midterms. They targeted voter registries, election officials, and other networks used to run the midterms. The attackers had some âlimited success,â according to intelligence reports reviewed by the Globe, but itâs unclear exactly what that means. Most of the incidents were âforeign-based,â according to official reports. There are also other apparent meddling efforts. On Monday night, Facebook blocked 115 ac counts â" including 85 on Instagram â" that US law enforcement said might be connected to foreign organizations that want to meddle in the election. Most of the Facebook pages were in French and Russian, but the Instagram posts were mainly in English. Facebook has also had to delete fake accounts tied to Iran in the months before the midterm elections. The officials offered three main ways to minimize the risk of influence by foreign governments. âGet election information straight from the source â" your state or local election office.â They will have up-to-date information on where and how to vote, as well as election results. âThink before you link.â Be careful about the information promoted on social media or elsewhere. A good practice is to verify something from multiple sources before assuming itâs true. Report any suspicious activity, whether itâs eye brow-raising ads online or divisive information spread by an unknown source. But again, the important thing to keep in mind is that a foreign country wonât alter your vote after it has been cast, according to the Trump administration. Not even Russia can do that â" at least not yet.